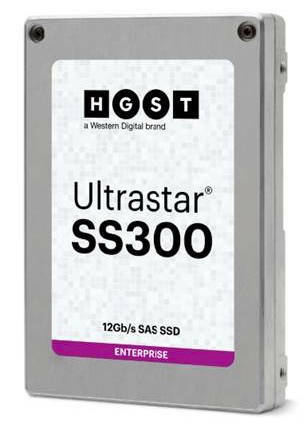 HGST has released the Ultrastar SS300, an enterprise server SSD that's 1.6 times faster than its predecessor. It follows the MLC-based SS200, which used SanDisk 15nm NAND and came in a 480GB-7.68TB capacity version and a 400GB-6.4TB endurance version. The SS300 is a bewilderingly varied SSD, coming in both 3D MLC (2bits/cell) and TLC (3bits/cell) versions, with varying power and endurance levels. The SS300 also has a choice of security options, including Instant Secure Erase (ISE), Self-Encrypting Drive (SED)-compliant with TCG Enterprise and SED-compliant with TCG Enterprise with FIPS 140-2 certification.